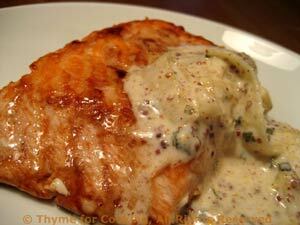 Salmon with Mustard Cream, quick, easy gourmet dinner. When roasting salmon, I line the baking sheet with foil and cook them, skin side down, without turning. When done, I slide them off the skin and on to the plates, leaving the skin behind on the foil to wrap up and toss.